When looking for ammo for your Mosin-Nagant or other 7.62x54r chambered rifle, it makes sense to buy your ammo from the source. 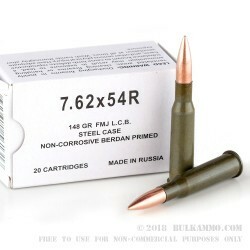 Wolf Ammo comes from the Tula Cartridge Plant in Tula, Russia, so you can be confident that Wolf knows how to make a high quality 7.62x54r round. Each round in this bulk case of 500 is new production, steel cased, berdan-primed, and non-reloadable. The round features a lightweight 148 grain bi-metal full metal jacket projectile. This round is perfect for the range training, so buy this bulk case and head out to the range! Quality all the way start to finish. Prompt. couteous in conversation...and not being from NY state, they are still free. Satisfied but jealous!. Q: Is this corrosive ammo? A: Hello! This Wolf ammunition is new manufacture and does not contain any corrosive components. Q: Can this ammo be used with russian mosin nagant rifle? 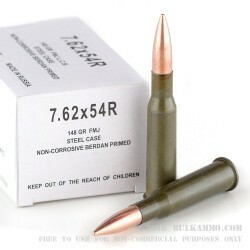 A: This ammo will work in any Mosin Nagant rifle chambered in 7.62x54r including those that are Russian. A: These bullets consist of a bi-metal jacket (a combination of steel and copper) that encase a lead core. 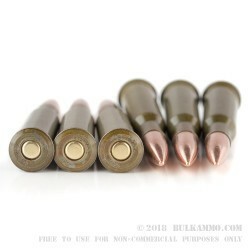 While these bullets are not "steel-core", they will attract a magnet because of the bi-metal jacket that surrounds the lead core. If your range has a strict policy against the use of bullets that attract a magnet, it would be best to not show up with this product and instead use a copper-jacketed round.